I was talking to a friend the other day and she said that what she and her husband would really like to start doing is find some properties that need some minor improvements, maybe some paint, and ‘Flip ‘em’. I didn’t comment as I didn’t want to crush their dreams. Everyone and their mother wants to ‘Flip’ homes now. They watch HGTV and see the Property Brothers or any number of shows, and they think it is EASY. This could not be further from the truth. It is TOUGH. It could be a financial strain. Months of work might or might not make money. The problem with people thinking that they can just flip-a-switch and make tens of thousands of dollars by just painting, adding new carpet, and selling the home is FLAWED thinking and has led many to lose a lot of money. I’ll get back to this in a moment. I digress. 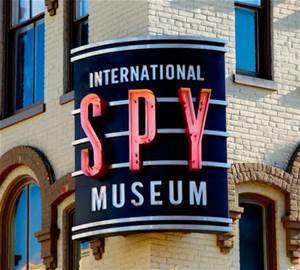 Last week I took Anthony, Alex, and 2 friends to the International Spy Museum. I’ve heard so much about the museum that I thought it would be a wonderful day trip to take the Boyz. That there was so much Spy Gear and a Double Secret 007 vibe of the museum that anyone would appreciate the tour. The sci-fi meets real world espionage is a must see. I knew that the 4 boys, ranging from 7 to 9 years old, would just love the museum. I was right. The Boyz had a blast! They were enthralled with the exhibits and the entirety of the double secret spy museum. This Museum, located right in the China Town area of DC near the Verizon Center (where the Caps, Wizards, and Georgetown play) is not a government museum. Thus there is an admission fee. But it is well worth the cost. A large majority of the exhibits come from the Cold War and, more than anything there, it is KGB issued. I imagine that these devices were what we confiscated throughout the years. And if there was a Spy Museum in Russia the artifacts would probably be CIA issued. There were spies in Russia during the Cuban Missile crisis. It was the information that these spies obtained that probably kept us from a nuclear war. There are modern day spies using state of the art information. Think those Drones are just for fun? Nope the military uses Drones to get behind enemy lines to get classified information. It was with the help of spies that we were able to overthrow Saddam Hussein and find Osama Bin Laden. In my opinion, Spies play an important role in society. They are information gatherers. Back to the story of people looking to invest in and ‘flip’ real estate. It sounds glorious. Buy a beat up house for cheap. Slap some paint and carpet on the house. List it. And sell for a huge profit. Easy enuff. The fatal flaw… Not having enough accurate information. That is where a Real Estate Spy comes into play. A potential client recently asked me how much to offer for a property. He said that he didn’t want to offer more that 80% of the tax assessed value. I had to explain that, first of all, a tax assessed value has absolutely NOTHING to do with the current value of the property. And even less to do with an improved or future value of that property. An assessed value is a ‘rough estimate’ based on square footage and any ‘permitted’ improvements of the property and could be as old as 3 years since the last assessment was completed. It doesn’t take into account the ebbs and flows of a real estate cycle. It doesn’t account for any improvements or upgrades done within the home. And it is just used to form a tax basis. Tax Assessments are even MORE inaccurate than Zillow’s famous ZEstimate that I wrote about in May’s 2015 Story From the Street. The CEO of Zillow admitted that nationwide the ZEstimates were off by 8% and , in some pockets, 30% off the actual value. So, if you can’t use a Tax Assessed Value or ZEstimate to determine a home’s value, what can you use? I have quite a few clients that are investors and are professional ‘flippers.’ When I talk with them about investing in Real Estate as a way to produce income, I use a baseball analogy. I tell them to look for doubles. Don’t always look for home runs. Take the consistent gains that have a high likelihood of happening instead of looking for home runs. If you look for home runs you might end up striking out and losing money. So when either myself or the investor identifies the property, the first thing I do for them is give them the ‘resale value.’ For example, I might tell the investor that the house, fixed up would sell for X. How do I do this? Because like the spy, I have access to information that the public doesn’t, but more importantly I know where to look for key aspects of the house and of the market that civilians might overlook. The intricate knowledge combined with the fact that I walk through thousands of homes a year, means that I can provide an insider assessment of value unseen by others. Once this ‘final’ number is put on the property the investor and I will talk about repairs and upgrades needed to get the house to that value. Then the investor will figure out the cost of those repairs and upgrades. From that we then factor in a profit margin needed for the investor to make money and then add an overage cushion. Once this is factored in, they decide what is a good price at which to purchase the house. Most people look at what they can buy an investment property for and make their decision whether to make an offer on not based on purchase price. This is flawed thinking, in my opinion. I teach my investors to start with the end sales price and work backwards. Just like the spies working for the CIA, the more information that you can gather when investing/flipping a home the more educated decision you can make. Is investing in Real Estate an exact science? Nope. Am I always 100% accurate? Nope. But the valuations that we provide are much more accurate than Tax Assessments and ZEstimates because of the insider knowledge.